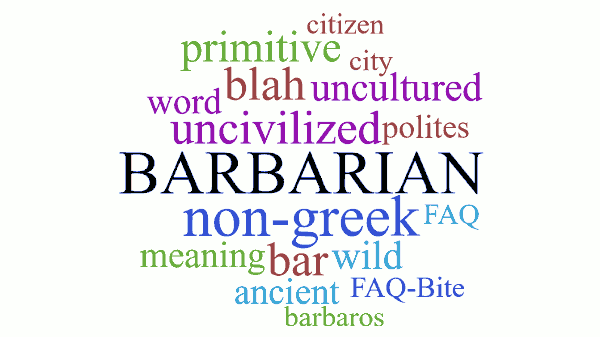 Where does the word Barbarian come from? What was an ancient Greek citizen called? Why did the ancient Greeks call them Barbarians? We get the word from the ancient Greeks, but there is no specific, single group of people who can be identified as Barbarians. The ancient Greeks also considered themselves to be the only properly civilized people in the world. They recognized that other people had civilizations, but those civilizations were either corrupt or fell short of the Greek ideal. A Greek citizen was known as a polites2 (πολίτης) – citizen of a city-state – which comes from the root polis meaning city and the modifier ites meaning member of. The Greeks also used the word xenos (ξένος) for foreigners, but this tended to be used for foreigners living in Greek city states. The term barbaros was reserved for those “uncivilized, unintelligibly babbling” foreigners in foreign lands. Later, the Romans conquered Greece and appropriated much of its culture. They also took this word, Latinized it to barbarus and expanded the definition of civilized people to include Romans. So all non-Greek and non-Roman people were considered barbarus – uncivilized foreigners. Today, Barbarian is used to describe someone who is uncivilized or primitive. Greek citizens were known as "polites" - meaning "citizen of a city-state"
Barbarian originally meant "all non-Greek people"